Review The arrival of Ubuntu 17.04 this month was completely overshadowed by Mark Shuttleworth's decision to abandon the Unity desktop for a stock GNOME Shell interface. The future of Ubuntu, though, is GNOME. More specifically the Ubuntu GNOME "flavour". Will there be an Ubuntu theme for GNOME? For now it doesn't sound like it. Shuttleworth's posts on Google+ have consistently used the word "stock" and – given that Ubuntu GNOME is a fairly stock version of GNOME – it seems very likely that, at least for the initial release in next year's Ubuntu 18.04, Ubuntu will look just like Fedora or any other GNOME-based distro. Shuttleworth says Canonical will "invest in Ubuntu GNOME with the intent of delivering a fantastic all-GNOME desktop... I think we should respect the GNOME design leadership by delivering GNOME the way GNOME wants it delivered." Well, as mentioned, it'll be around for the short term at least. But if you want to use Ubuntu over the long term, I'd suggest checking out GNOME now and getting comfortable before it's the default (or adopting another flavour if GNOME isn't to your liking). While it's probably too early to bet on just how "stock" Ubuntu's definition of stock GNOME will be, one thing I can guarantee won't be there is the HUD and all the UI keyboard shortcuts in Unity. GNOME does have decent keyboard-driven UI options, but nowhere near what Unity offered. The other main loss in moving from Unity to GNOME is Unity 7's "lenses", which integrated music players, photos and online services in a way that GNOME does not. In Unity you could play music, watch videos, browse photos and even do things online without ever needing to open another application. Other noticeable changes include a somewhat different file browser - Canonical heavily patched the GNOME Files app to get it to behave the way they wanted. And there's no way to sugar coat it, GNOME Files is probably the worst file browser out there. It'll take a little command line tweaking to get GNOME to always use Nemo (basically you need to set some default file handlers with xdg-mime) and some GNOME themes may not work, but overall it's a far superior experience to Files. Alternately you might check out my personal favourite, ranger. It's entirely console based, but very powerful. And seriously, even just using mv, cp and other basic Unix tools is a step up from Files. Once you get past the loss of Lenses, the keyboard shortcuts and the crap file manager, GNOME is actually very nice. I happen to prefer it to Unity for one simple reason: it's faster. There are some caveats to that statement: for example, I primarily use a Lenovo x240. If you have some high-end graphics card you may not notice a difference, but overall I find GNOME to be just a hair faster to respond to keyboard shortcuts, a bit quicker to draw its animation, and the search UI never hesitates the way it sometimes does in Unity. It's a small difference, but day in and day out it adds up to a big one. GNOME also has some nice apps that, while available in Ubuntu's repos, were not defaults and did not look very good when installed in Unity. Apps like Maps, Calendar and Photos have come a long way and will cover most users' needs quite well. 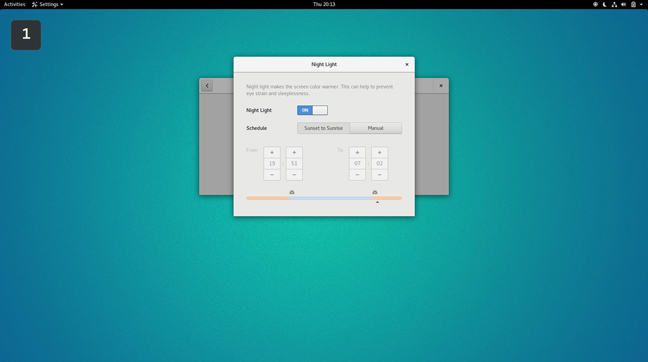 If you choose to make the leap to Ubuntu GNOME in 17.04 you'll be using GNOME 3.24, which has a couple of nice new features, including a new "Night Light" app that changes the tint of your screen to a warmer spectrum when the sun goes down. It's basically a built-in version of what apps like Redshift offer, with the added bonus of working under Wayland, which Redshift does not do without quite a bit of workaround hacking. Other GNOME 3.24 changes include a brand new Control Center, which has redesigned quite a few panels – Unity users, brace yourselves: in the GNOME world an update almost always means rather large UI changes, some for the better, some not. If that bothers you, check out KDE or Xfce – including the Users, Keyboard & Mouse, Online Accounts, and Printer panels. In this case I'd call most of the UI changes a step up, particularly Online Accounts, which has added support for NextCloud. 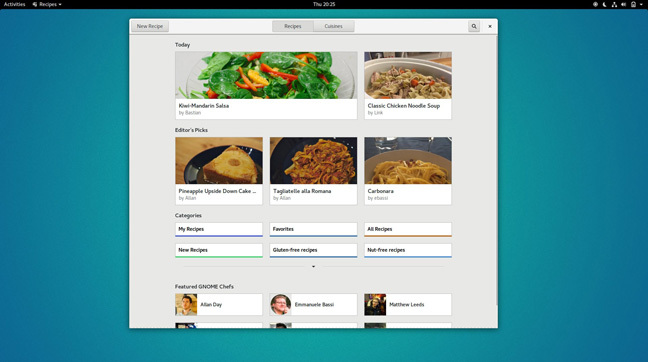 GNOME also continues to expand its set of default applications, the latest edition being Recipes. It's not installed by default, but if you're looking to move beyond Mountain Dew and Cap'n Crunch, GNOME can help. Maybe. Recipes is still in the very early stage and lacks content, but eventually it will allow you to add, edit, share and track recipes of your own. A recipes app is probably not much consolation for fans of the Unity desktop, and, while I'll admit I never particularly liked Unity, I am sorry to see it go.